Fairies and nature are the inspiration for this Collection. Deep green Jade, Pyrite, Antique Bronze metal and complementry shades of cold enamelling unite all the pieces, so you can mix and match across the collection. This longline necklace fastens with a decorative toggle clasp, then rosary style beaded chain joins to a central cold enamelled connector. 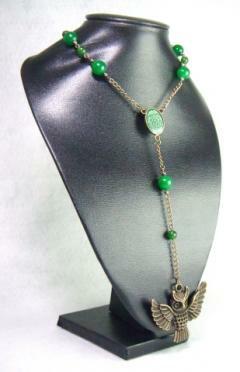 A further length of rosary beaded chain drops from this and ends in a large Antique Bronze owl pendant. The Fairy Forest Jewellery Collection is inspired by myth, legend, Fairies and the wonders of woods and trees.